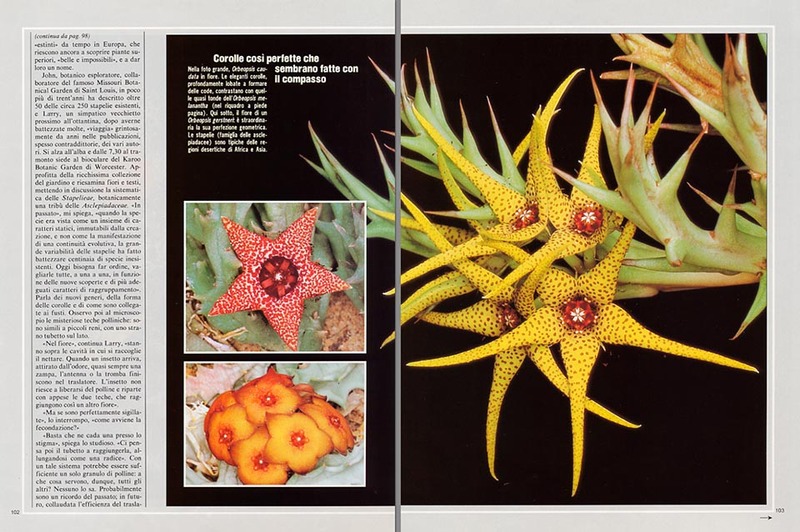 Succulent plants, mostly South African, with star shape flowers. Beautiful but stink of putrefied flesh. Pityless with pollinators. How they decive insects at the desert limits. 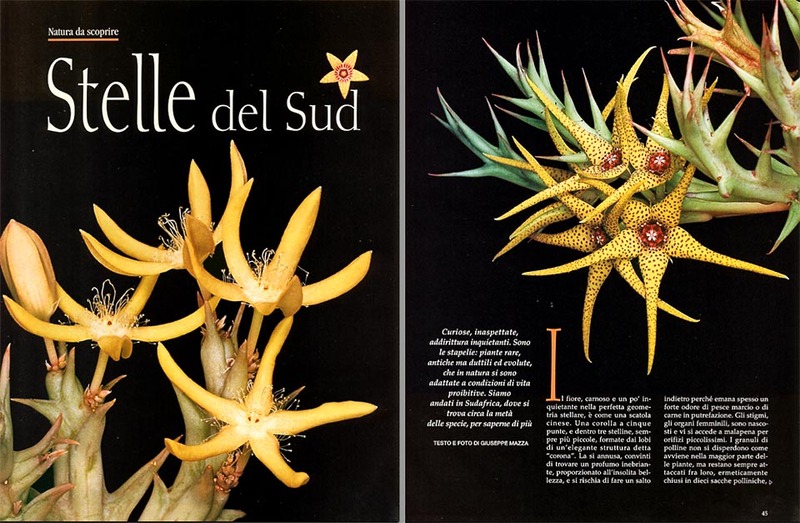 The Jardin Exotique collection in the Principality of Monaco. The flower is like a Chinese box: a corolla with five points, with the form of a star, with, in the centre, three small stars, smaller and smaller, formed by the lobes of a very complicated structure, called “crown”. He who smells them, runs the risk to jump backwards, because many stapelieae stink of fish or rotten meat, and all this, botanically, appears unreasonable. The stigmas, feminine organs, are hidden, you can reach them with difficulty, through very small orifices, and the granules of pollen, do not disperse, as it happens for most of the plants, but remain always tied each other, hermetically closed in 10 bags. I observe them from nearby: they are coupled, like cherries, by special forks, typical of the family, the “traslators”, which catch the insects compelling them to carry, two by two, the heavy pollen masses. Odd structures! They are not composed of cells, as the rest of the flower, but of a particular resinous matter, resistant and elastic, solidified according to a well definite form. There is enough material to stimulate the curiosity and to confuse the experts! To meet them, to see these mysterious stars in nature and to admire them in the best collections, I have gone to South Africa, where about half of the species grow. 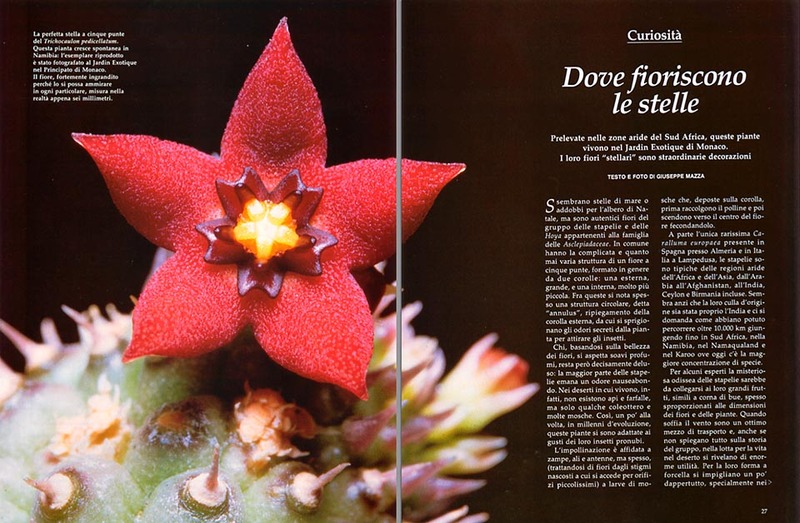 In Europe, in fact, apart the very rare Caralluma europaea, present in Italy, in the island of Lampedusa, and in Spain, close to Almeria, the stapelias must be searched for, carefully, to the lovers’, or in few botanical orchards specialized in succulent plants, like the Jardin Exotique of Monaco. Since millennia, under the vast southern skies, they bloom even where life seems impossible, in the deserts, sheltered by rocks or bushes. Plants with an old pedigree, they sink their roots in the Cretaceous, but they are not, as often happens for uncommon species, “living fossils”: they form an active group, in full evolution development, ready to review the choices done in the past for more advantageous choices. “Living fossil”, on the contrary, for this time, looks to me those who study them: John Lovranos, Larry Leach and other friends down there, “extinct” characters since time in Europe, who, close to the year 2000, are still able to discover superior plants, “beautiful and impossible”, and christen them as it was done at the heroic times of Linnaeus. 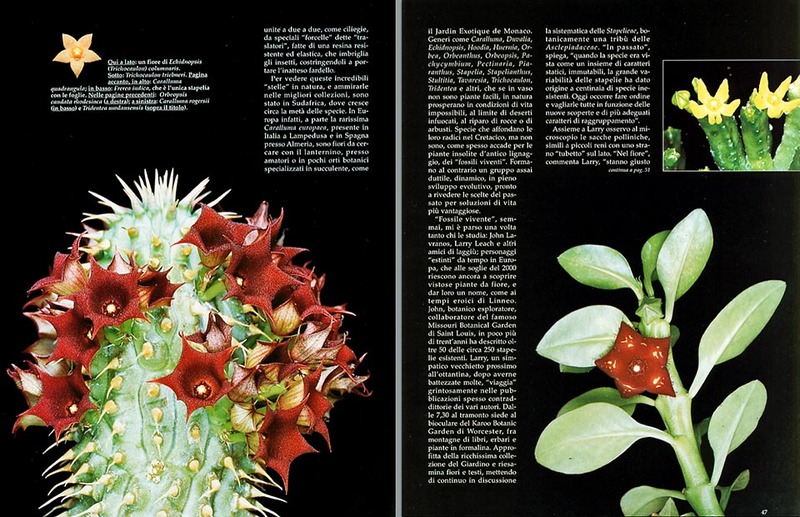 John, botanist explorer, collaborator of the famous Missouri Botanical Garden of St. Louis, in less then thirty years has described more than 50 of the about 250 existing stapeliae, and Larry, a nice good old man, almost eighty, after having christened many of them, “travels”, since years, in the publications, often contradictory, of different authors. He gets up at dawn: a thrifty meal, few meters by walking between the lodge and the laboratory, and from 0730 hrs. to the sunset, sits at the biocular of the Karoo Botanic Garden of Worchester, surrounded by mountains of books, herbaria and plants in formalin. 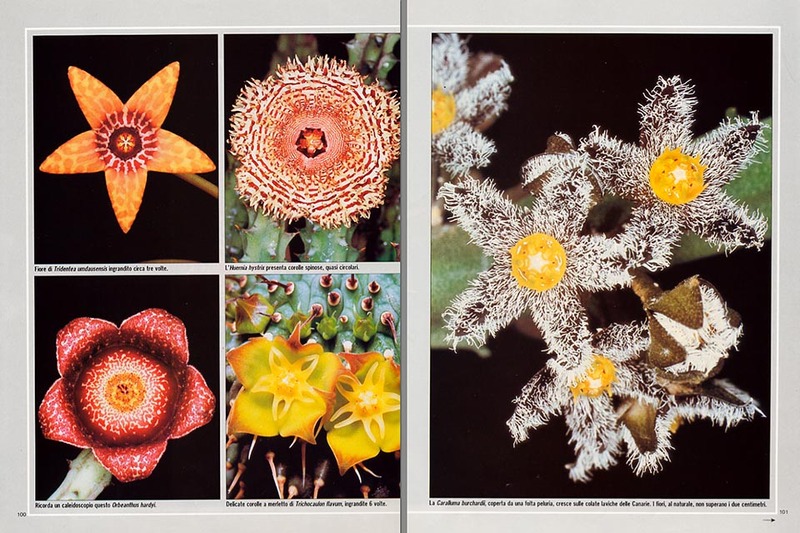 He avails himself of the very rich collection of the garden and re-examines flowers and texts, questioning continuously the systematics of the Stapeliae, botanically a clan of the Asclepiadaceae. Every 2-3 hours, he gets a cup of tea, but cannot allow himself the luxury of an interview. “I still have few years to live”, he repeats smiling, “and I must complete my revision”. Then, challenged by the questions, he shows me the first three books published, and starts talking. 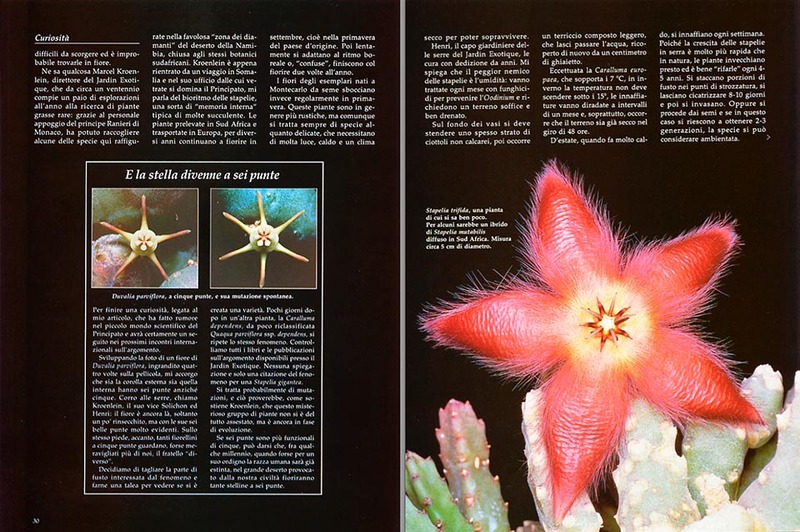 “In the past”, he explains me, “when the species was seen as a whole of static characters, unchangeable from the creation, and not like the manifestation of an evolution continuity, the great variability of the stapeliae has originated hundreds of non existing species. Nowadays, it is necessary to set order, to examine them all, one by one, according with the new discoveries and the more adequate characters of grouping”. He talks about the new genera, the form of the corollas, and of how they are connected to the stems. I observe then, at the microscope, the mysterious polliniferous bags: resembling to small kidneys, with an odd small tube on the side. “In the flower”, Larry goes on, “they are placed just over the cavity where the nectar assembles. When an insect comes, attracted by the scent, almost always, a leg, the antenna or the proboscis, go into the traslator. It is not able any more to get free, and goes away with the two polliniferous bags hung up, and, in this way, they reach another flower”. “But if they are perfectly sealed”, I interrupt him, “how does the fecundation happen?” “It is enough that one”, he goes on, “falls close to the stigma, and then intervenes the small tube, which gets longer, like a root, till when it reaches the stigma”. Seen that with this system only one granule of pollen is sufficient, we wonder what’s the use of all others. Nobody knows this. Probably it’s a memory of the past, and in future, tested the efficiency of the traslator, their number will reduce. I stroll about the garden for a week, watching, with a Hasselblad equipped of monstrous prolonging rings, the opening of hundreds of stars, and I ask to all the botanist I meet where I can find some beautiful ones, “in nature with the landscape”. The stapeliae are in fact very mimetic plants, with whimsical flowers, often small, which bloom when they wish to do so. 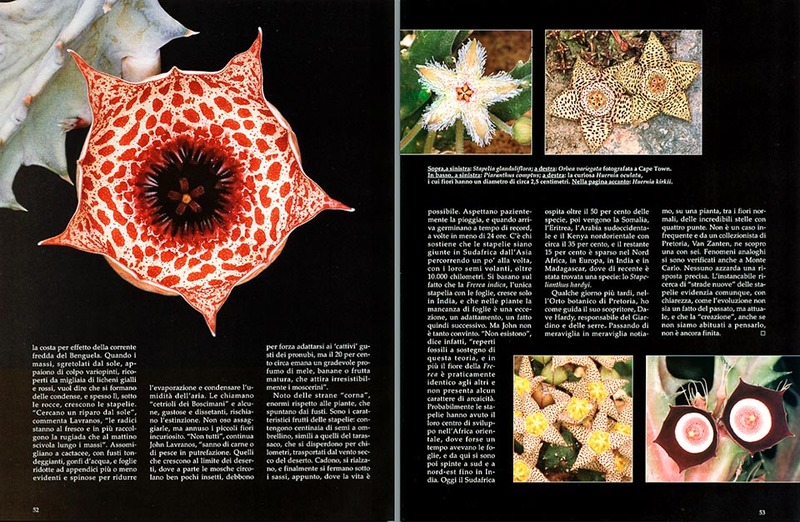 At last, Ernest Van Jaarsveld, phones me from the famous Botanical Orchard of Kirstenbosch, that in a place near Cape Town, the Orbea variegata is in flower, but for photographing it “by day, some problems can arise”. I do not understand well this, but I join him at once and a few hours later, we are in an enchanting bay, surrounded by huge rocks. The great yellow-striped flowers of the Orbea variegata decorate indeed the rocks overhanging the sea, but have the “little” shortcoming of growing up in the only beach for nudists of all South Africa. I will have to contempt, later on, of the usual close-up with the flash. I will photograph them in nature with John Lavranos in Namibia. We have gone, looking for plants, with two jeeps, where nobody was going since years, where the rain is a rare vent, and during the day, temperatures even overcome the 45 °C. The life is tied to thousands of tricks, and to the incredible morning fogs, which form, along the coast, due to the cold stream of Benguela. Where the scraps of old cyclopean rocks, shattered by the sun, become suddenly many-coloured, covered by thousands of yellow and red lichens, that means that condensations take form. And there, often, under the rocks, we find the stapeliae. “They look for a shelter from the sun”, John Lavranos comments, “the roots stay in the coolness and, in addition, they collect the dew which, in the morning, slide along the rocks”. They resemble to the cactaceae, with roundish stems, swollen of water, and leaves reduced to appendixes more or less evident and thorny, in order to reduce the evaporation and condense the humidity of the air. “They call them Bushmen cucumbers”, he continues, “and some species, tasty and thirst-quenchers, risk the extinction”. I do not dare to taste them, but, curious, I smell the little flowers. “Not all”, John explains me, “smell of putrefying meat or fish. Those which grow up in the desert, where, but some flies, there are few insects, must forcefully adapt to the poor likings of the pollinators, but about the 20% emanates a pleasant scent of apples, bananas, or of ripe fruit, which attracts irresistibly the gnats”. Further ahead, I notice some odd “horns”, enormous, if compared to the plants, which come out from the stems. They are the typical fruits of the stapeliae: they contain hundreds of seeds with umbrella, which spread for kilometres, carried by the dry wind of the desert. They fall down, get up, and finally, they stop where there is an obstacle: rightly, under the stones. The life, there, is possible: they wait for the rain, even for some years, and when then, miraculously, this arrives, they quickly germinate, sometimes, in 24 hours. “Often”, John remarks, “the calyx of some fecundated flowers does not fall at once with the corolla, to make place to the fruit, but blocks up, waiting even six months before producing seeds. 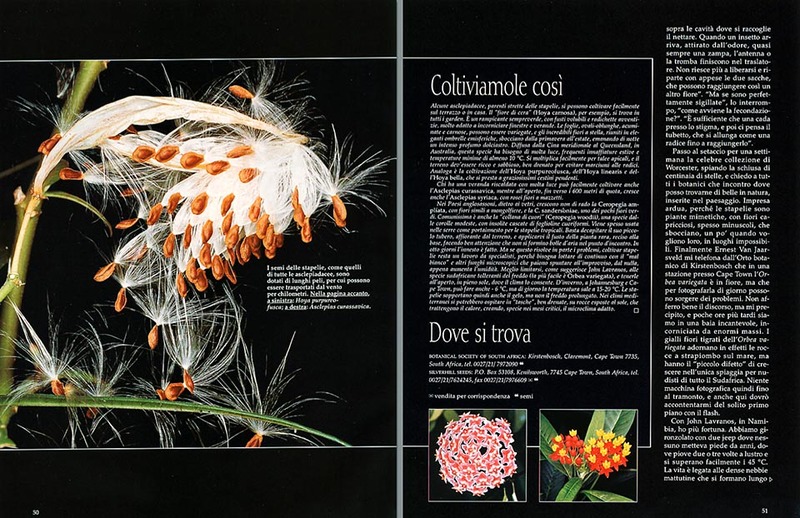 Thus, the plant has a second choice of sowing, which then administers mysteriously, according to the climatic course”. There is somebody affirming that the stapeliae have come to South Africa from India, travelling slowly, with their flying seeds, for more than 10.000 Km. 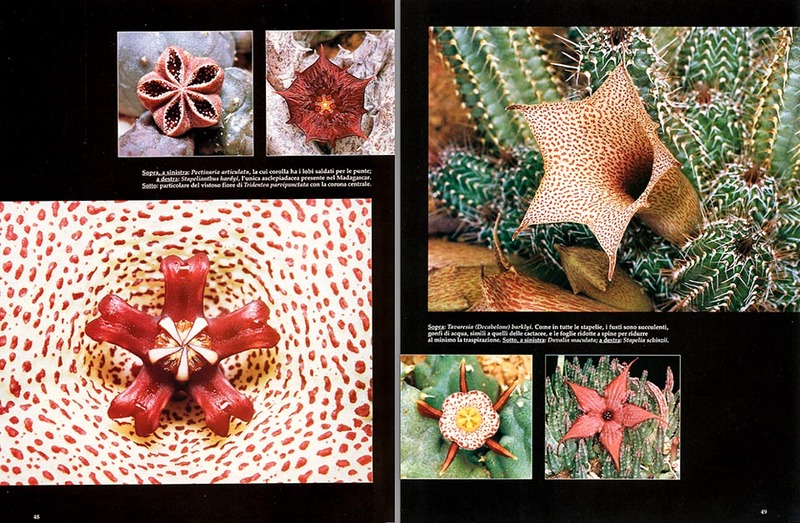 They base themselves on the fact that the Frerea indica, the only stapelia with leaves, grows up in India, and that in the plants, the lack of leaves is an exception, an adaptation, therefore, a successive achievement. But John is not so much convinced of this. 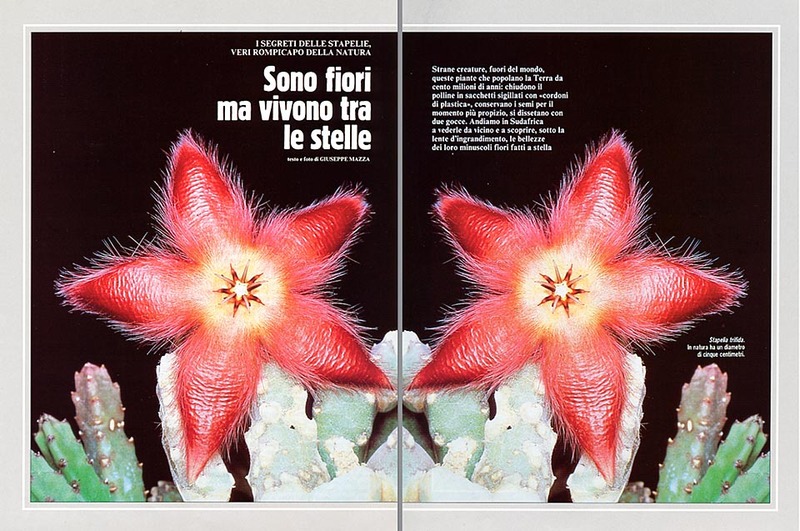 “There are no fossils”, he says, “supporting this theory, and, furthermore, the flower of the Frerea, practically identical to the others, does not present any sign of archaism. Probably, the stapeliae had their centre of development in East Africa, where, once, maybe, they had leaves, and from there they have moved southwards and north-eastwards till India. 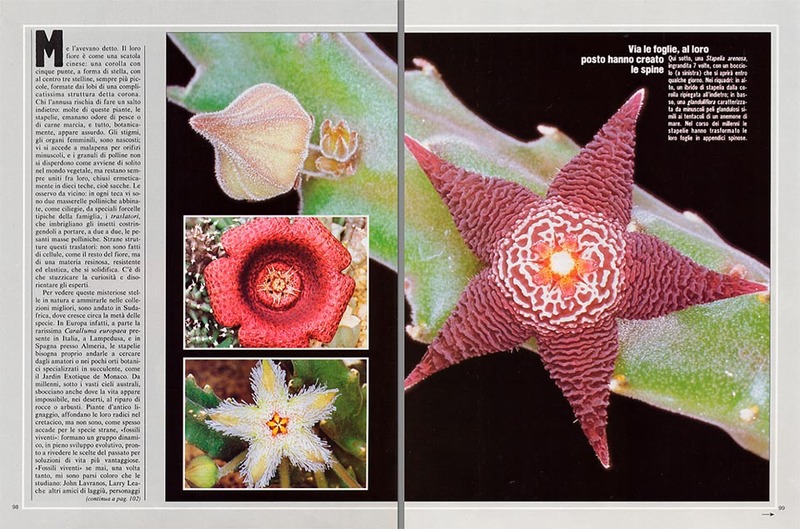 Nowadays, South Africa holds more than the 50% of the species, then we have Somalia, Eritrea, the south-west of Arabia, and the north-east of Kenya, with about the 35%, and the remaining 15% is scattered in North Africa, Europe, India, and Madagascar, where recently, a species has been found, the Stapelianthus hardyi“. A few days later, in the Botanical Orchard of Pretoria, I have as guide its discoverer, Dave Hardy, responsible for the Garden and the greenhouses. Passing from a wonder to another, we notice, on a plant, between the normal flowers, some incredible stars with four point. It is not a rare instance, and I discover one with 6 points at a collector of Pretoria, Van Zanten. Similar phenomena have occurred also in Monte Carlo. Nobody risks to give a definite answer. 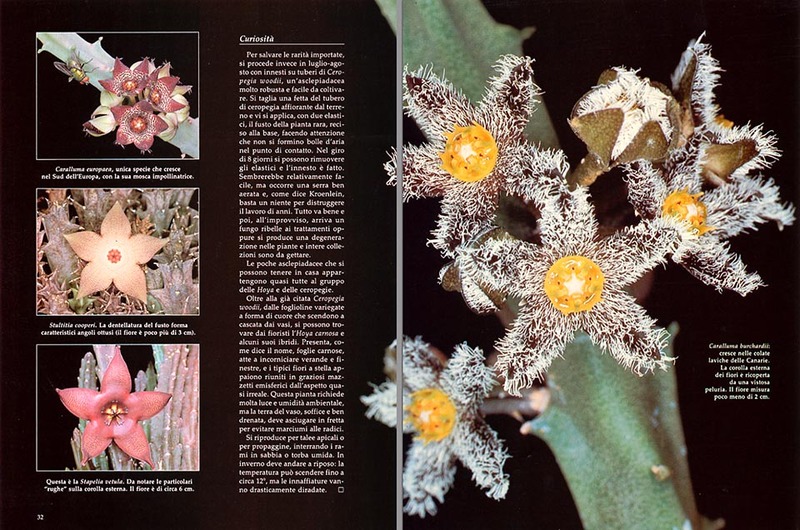 The untiring research of “new ways” of the stapeliae, emphasizes, however, with clarity, how the evolution is not something belonging to the past, but is effectual, and that the “creation”, even if we are not used to think to this, is not yet completed. Some asclepiadaceae, close relatives to the stapeliae, can be easily cultivated in a balcony or at home. 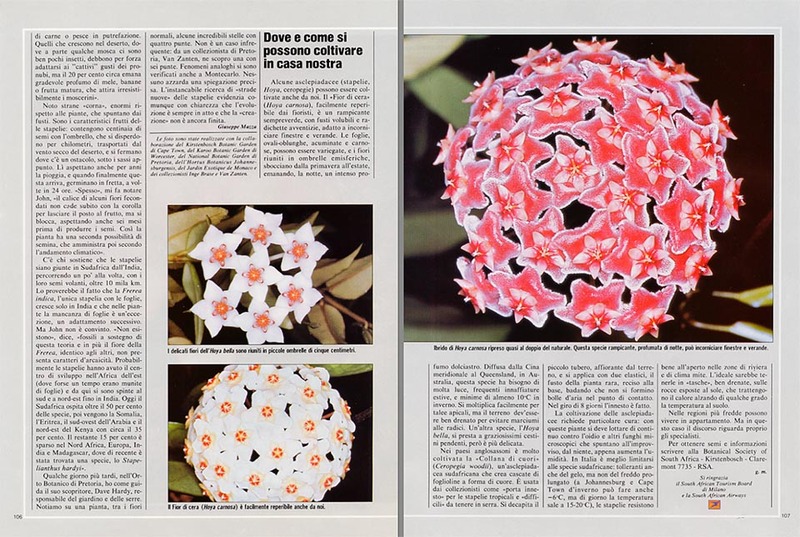 The “Wax flower” (Hoya carnosa), for instance, can be found in all gardens. It’s an evergreen climbing vine, with climbing stems, and small temporary roots, very much indicated for framing windows and verandas. The leaves, oval and oblong, pointed and fleshy, can be variegated, and the incredible star-shaped flowers, assembled in elegant hemispheric umbrellas, open from spring to summer, emanating, by night, a sweetish smell. Spread out from southern China to Queensland, in Australia, this species needs a lot of light, frequent summer watering, and lowest temperatures not under the 10 °C. It multiplies easily by apical cuttings, and the soil must be rich and sandy, well drained, to avoid the rottenness of roots. Similar is the cultivation of the Hoya purpureo-fusca, the Hoya linearis, and the Hoya bella, which is suitable for charming hanging baskets. He who has a veranda warmed with a lot of light, can easily cultivate also the Asclepias curassavica, whilst in the open air, till the 600 metres of altitude, we can grow also the Asclepias syriaca, with pink flowers in small bunches. In the Anglo-Saxon countries, behind the glasses, frequently do grow up the Ceropegia ampliata, with flowers looking like aerostats, and the sandersonii, one of the few green flowers; and is very frequent the “Chain of hearts” (Ceropegia woodii), a species with modest corollas, with unusual trailing branches of heart-shaped leaflets. It is often used in the greenhouses as “graft carrier” for the tropical stapelia. It is sufficient to behead its small tuber, appearing from the ground, and to apply there, with two rubber bands, the stem of the rare plant, cut at the base, paying well attention that bubbles of air do not form in the meeting point. In eight days the grafting is done, and the rubber bands can be taken off. 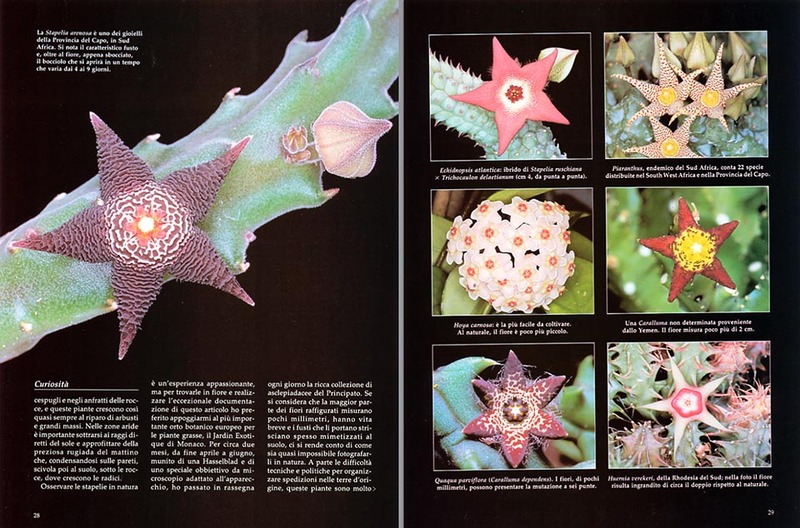 But, if this settles partially the problems, the cultivation of stapeliae remains a work for specialists, because you have to struggle continuously against the “white sickness”, and other microscopical fungi which spring up suddenly, from the nothing, as soon as the humidity increases. Better to confine oneself, as John Lavranos suggests, to the South African species which tolerate the cold, and keep them in the open air, in full sun, where the climate allows this. During wintertime, in Johannesburg and Cape Town, it can be even -6 °C, but during the day, the temperature then rises up to 15-20 °C. The stapeliae endure therefore also the frost, but not the prolonged cold. In Mediterranean climates, they could be kept in “pockets”, well drained, on rocks exposed to the sun, which can retain the heat, creating, particularly during the critical months, a suitable micro-climate. 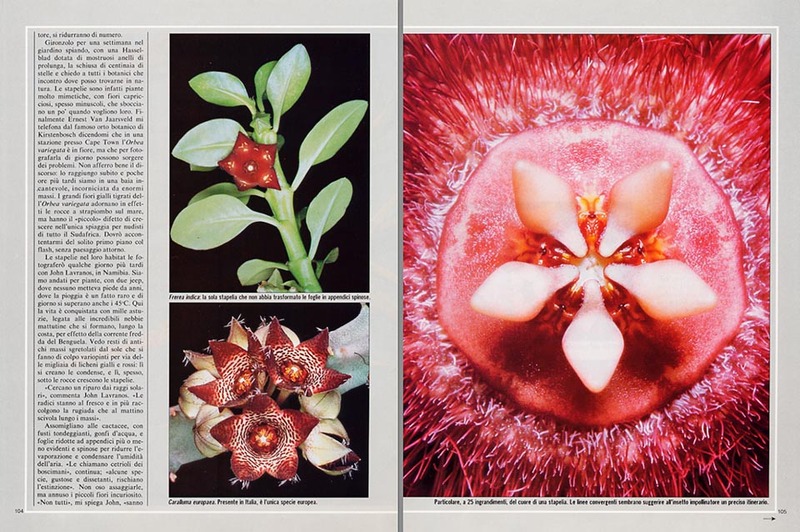 → To appreciate the biodiversity within the ASCLEPIADACEAE, now inside the APOCYNACEAE family, please click here.